This photo shows emissions from the Cumberland Fossil Plant. Coal is considered a cost-effect energy source for electricity, but the pollution and greenhouse gas emissions pose a threat to personal health and the environment. Scientists are working on strategies to reduce emissions. The Science: Coal is a non-renewable energy source because coal is developed through millions of years under extremely high temperature and pressure. Coal power plants burns coal to boil water and make steam. Next, the high-speed steam turns turbines to generate electricity. When the turbine is turned, the magnets rotate around a electrical wire, which moves an electron across the wire. The flow of electrons is the electricity generated. 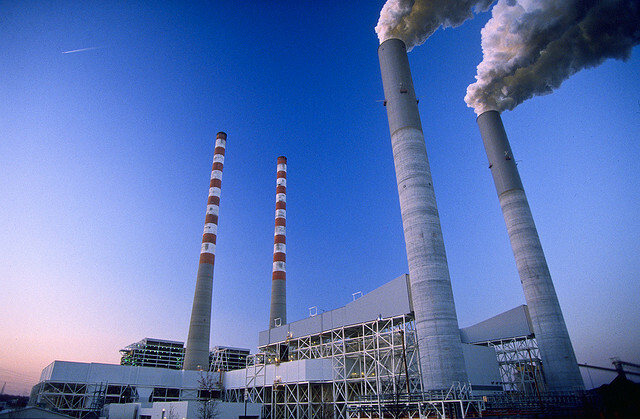 Physical Elements: In order to effectively utilize coal for electricity generation, coal power plants need easy access to coals, which can be mined and transported locally or internationally. Coal can be mined through surface mining (if coal is buried fewer than 200 ft underground) and underground mining. Coal can be delivered to power plants by trains, trucks, barges, and pipeline (if it is crushed and mixed with water). In addition, electricity production from coal must be cost-effective in terms of mining, transportation, and production of electricity. The Photo: I chose the picture because it shows three chimneys and a clean blue sky with streaks of fumes coming out of coal power plants. As coal is considered a cost-effective energy source for electricity, it is widely used. For example, coal burning produced 11.4 % of electricity generated in Canada in 2011. I believe that the three chimneys in the picture represent the abundance of coal power plants due to its low cost. However, the blue sky with streaks of fumes in the picture represents the pollution and greenhouse gas emissions generated by coal burning. In Alberta for instance, Canadian health and environmental groups reported that the environmental and health cost of burning coal for electricity are close to $300 million each year. In summary, the picture shows that coal burning for electricity is widespread due to cheap costs but results in pollution and health problems.